Just fill in the form below to get in touch with me. I will try and respond as soon as I can. Here are some Marcel Tabuteau recordings. If your child one day comes home and says he wants to play the oboe, you must find a decent teacher in the area. Her are some hints and tips. They say that you can't really tell much about a reed by the way it looks. I think that is true, however looks do play a small part in how the reed functions. 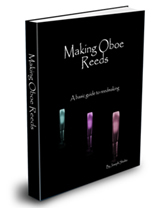 Balancing an oboe reed can be difficult, especially if you are not that experienced at it. There are some things that can help however. Here is a story about the Curtis Institute. Very interesting!! Buying oboe music is a lot easier now with the internet. Prices are very competitive and actually, the selection is better than most music stores. Oboe music with cd accompaniment, especially Music Minus One is one of the greatest ideas since they started recording music. Double hollow ground knife sharpening is not that difficult. Here is some help to get your oboe reed knives sharp. Confused by the oboe reed knife sharpening task that we are stuck doing? Well, you've come to the right place. Let me try and explain in plain ol English. Knife sharpening can be a tricky business, but sharpening oboe bevel knives can actually be easier than double hollow ground knives. Reed testing is a very important aspect of reed making. The most important thing a reed can do is to function properly. More Oboe Warm Up Exercises. Try them and see if your sound improves. o, you're searching for that perfect oboe sound. But do you know what you are really searching for?